Wild Ponies, also called Banker Ponies or Wild Mustangs, hold a special place in Ocracoke’s history. According to legend, the ancestors of Ocracoke’s Wild Ponies escaped and survived shipwrecks on the shoals of North Carolina. There are also surviving documents from 16th and 17th century Spanish expeditions that indicate that Spanish horses and other livestock were either deliberately left behind or thrown overboard to lighten the ship's load. Remarkably, Wild Ponies run freely on Ocracoke Island. Today’s Ocracoke and Corolla (and Shackleford Banks) Wild Ponies are descendants of this hardy Spanish breed of Arabian ancestry, sharing the striking similarity of having one fewer vertebra than other equine breeds. The Spanish Mustang Registry is satisfied these ponies are as lineally pure to the 16th century Spanish horses as can be found in North America today. In 1959, to preserve the heritage of Ocracoke’s Wild Ponies, they were penned in a secluded 180-acre area on the sound side of the Cape Hatteras National Seashore. 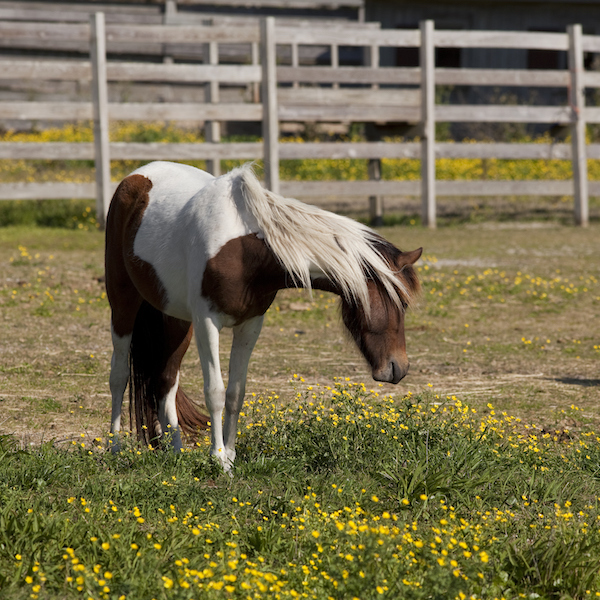 Visitors can catch a glimpse of the Ocracoke ponies in the fenced in area located close to the feeding stations. This area, referred to as the Ocracoke Pony Pen, is located on NC Hwy 12 between the Ocracoke/Hatteras Inlet ferry landing and Ocracoke Village, about seven miles north of the village.